When Microsoft & Apple both AGREED that HTML5 was the future of web design, everyone suddenly took notice. And the last 18 months have seen an amazing adoption of HTML5 design principles, especially with the way Google has been been promoting it. So what is HTML5 and how do you do it? I have been a client of Vodacom’s for the last 12 years but not any more. In the last 2 months I have met nothing but gross incompetence from them on every level. If I had not paid them so much money over the years, this might actually be funny! I used to be a real fan of Google+ but I am being forced to review my position on it. I have had my profile suspended, apparently for impersonating someone. 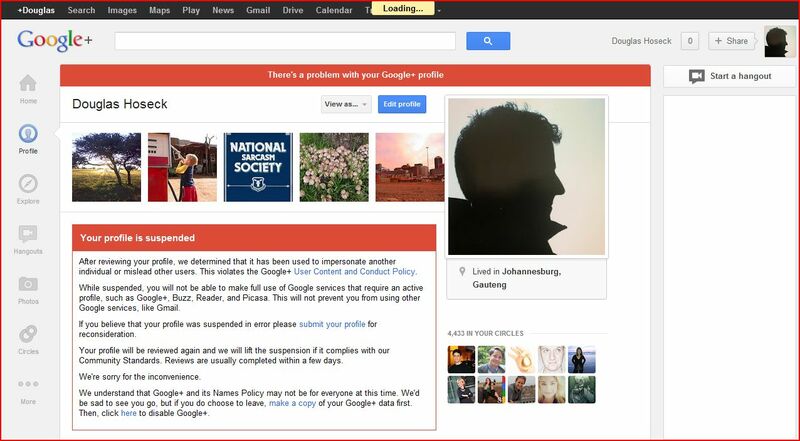 I cannot imagine who that someone is, since my Google+ profile is listed under my own name.